"Enemy Mine" is "Robinson Crusoe" set under the two suns and six moons of the volcanic planet Fyrine IV, a grim red landscape lashed by meteors and savage cold. One day, a century in the future, the spaceships of two warring pilots crash-land not far from each other. One of the pilots is a gee-whiz earthling, and the other one is a reptilian humanoid from the planet Dracon. Although they are natural enemies, they learn to live together, to help each other and eventually even to love each other. The look of the planet in "Enemy Mine" is so convincing, the special effects are so elaborate and the performances are so good that I only gradually became aware of what a clinker the story is. The movie has the potential to be a truly great story about communication between alien species; it could have been a space thriller with a mind and a heart. Instead, it gives us an alien that is too human, too familiar. It takes that amazing planet and gives it food, water, gravity and atmosphere that are suitable for both humans and Dracs. It depends on plot gimmicks like the convenient arrival of enemies and the equally convenient arrival of friends to the rescue. It doesn't dare enough. How should it dare? The world of science fiction is filled with fascinating aliens - intelligent creatures who are infinitely more than lovable characters in reptile skins. Why couldn't the Drac be truly alien in this film? There are occasional moments of inspiration, such as the fact that Dracs are male and female rolled into one, but "Enemy Mine" simply uses that as an excuse for a couple of weepy scenes and the creation of a Drac child that seems destined for the Little League. The idea of aliens with combined sexes has been handled much more interestingly in books like Isaac Asimov's "The Gods Themselves," in which there were three sexes, not two. And even the most rudimentary science fiction aliens usually manage to seem truly different than humans; once the Drac in "Enemy Mine" learns English, he seems scarcely less human than the human. The Earthman in the movie is played by Dennis Quaid, and the Drac by Louis Gossett Jr. They are both very good, but saddled with a predictable and sentimental script. If they had been left all alone on their barren planet, they might just possibly have arrived at some interesting story possibilities. 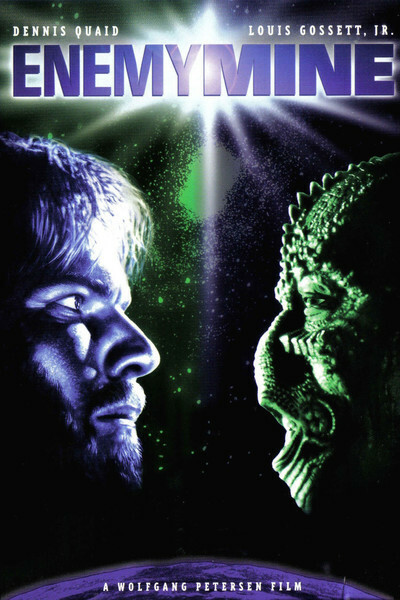 Instead, "Enemy Mine" descends to the level of 1930's space opera with the arrival of evil human slave-traders who kidnap Dracs and force them to work in mines. As the slavers stood over their captives with whips, I found myself wondering how cost-effective it would be to transport manual laborers millions of light years. Surely a technology capable of arriving at the planet Fyrine IV would have figured out a better way to mine its ores? Then there are the truly unbelievable moments, as when Quaid's apparently lifeless body is found by a human spaceship that is never seen; the cornball moment when he comes back to life; the human spaceships returning to Fyrine like the cavalry to the rescue, and the final idiotic shootout. Were they so bankrupt of ideas, in a movie rich with them, that they had to resolve the plot with yet another fistfight and gunfight? By the time the noble, uplifting ending arrived, I'd given up. Here is a movie that made no compromises in its art direction, its special effects and its performances - and then compromised everything else in sight.